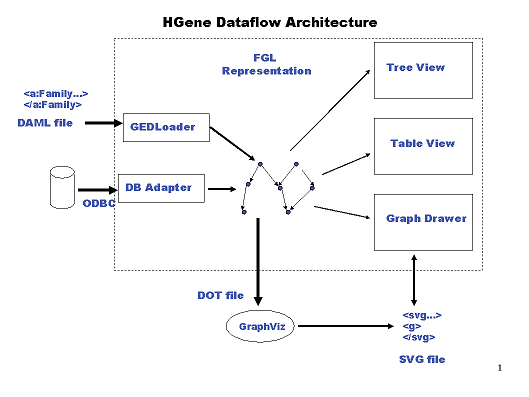 HGene is a genealogical authoring tool. Genealogical information forms a graph. Charts need to be intelligent. For example, selecting a box showing a person, the user can view details for the person and add these details to the chart. Charts are not just one shot. Once a chart is generated, users will want to add (and remove) people from the chart. For example, select a person and right mouse click to add the children or the parents of the person to the chart if they are not already present. A person can appear in more than one chart. Charts can be tailored to show a particular fragment of the overall graph. User wants to group people and charts to form chapters and these into books and to output these to HTML or PDF. Internally, information is stored as an FGL graph. Use of GraphViz to generate chart layout to PNG or SVG. Chart editor that can read GraphViz SVG output and save out. Tool to import GedXML files into database. Basic query and navigation features. Capability to arrange people and charts into books with the ultimate aim of generating a book as a set of HTML pages or PDF. Sample database based on genealogy of families involved in English Wars of the Roses. This is a good example showing that genealogy information does indeed form a graph. Note: There is no update facility provided as yet and no immediate plans to. In theory genealogical data is 'write once' data. GedLoader - GEDCOM file which is in DAML format. HaskellDB/ODBC - Connector to database. Table View - View person records. Properties - View details for selected person. Tree View - View tree representation of books and chapters. Chart Viewer - View PNG output from GraphViz. Chart Builder - Control generation of chart using GraphViz. Chart Drawer - Read GraphViz SVG files and output 'in the same style'. These files do contain information about the underlying database record. Allow user to control colours, text font and line width. Undo/Redo stack. Lines snap to nodes and dragging node will drag lines as well. This page was last modified on 6 February 2007, at 18:30.